House cleaning. Working the cash register at a Chinese restaurant. Walking dogs. Running a dry cleaner. 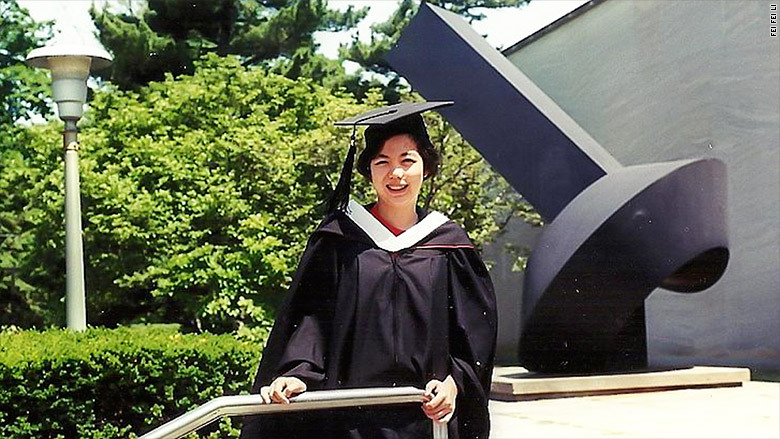 Fei-Fei Li arrived in the U.S. from China at age 16 with many big dreams. And it took many odd jobs to help her achieve them. Luckily, she was smart -- and extremely driven. And today, she's the director of Stanford University's artificial intelligence lab. "As one of the leaders in the world for A.I., I feel tremendous excitement and responsibility to create the most awesome and benevolent technology for society and to educate the most awesome and benevolent technologists -- that's my calling," Li said. She is also a staunch advocate for diversity in the tech industry. "I see extremely talented Stanford PhD students struggling with their visas and I find it unthinkable that we create so many hurdles for the talents of the world," Li said. 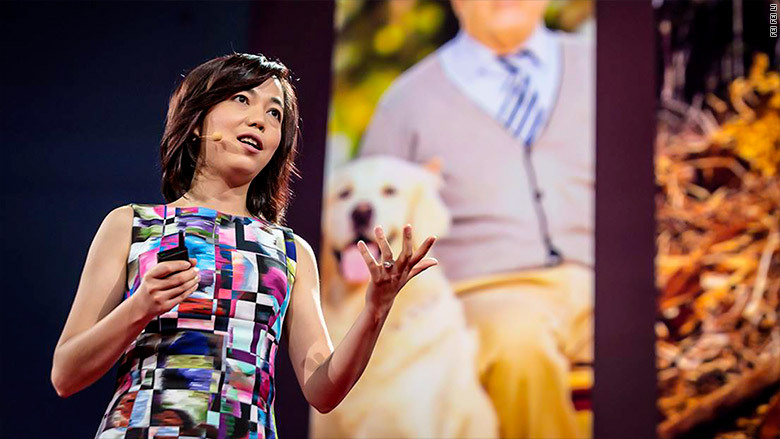 Fei Fei Li delivering a TED Talk. As an immigrant herself, she knows their journey requires sacrifice and determination. While Li was in college at Princeton, she borrowed money from friends -- and even her high school math teacher -- to buy a dry cleaning business for her parents in order to help them get by. Li attended classes during the week and worked at the business on the weekends. Then, when Li was in graduate school, her mom developed cancer and had a stroke. It was difficult to keep moving ahead while all of this was happening. "The real existential challenge is to live up to your fullest potential, live up to your sense of responsibility and to be honest to yourself about your dreams while doing it," she said. Li was recently named a Great Immigrant of 2016 by the Carnegie Corporation, the nation's oldest grant making foundation which honors roughly 40 naturalized U.S. citizens each year. Her graduate studies were supported by the Paul & Daisy Soros Fellowships for New Americans. 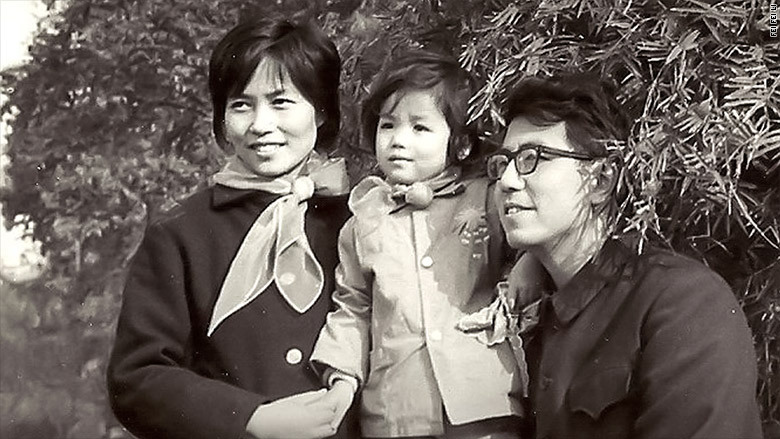 Li and her parents while they were still living in China. My parents were educated, but didn't speak English. So instead of being engineers and scientists, my father did camera repair and my mother worked as a cashier. We didn't have money so on top of all my studies, I did all types of jobs. I wasn't upset about doing that because my parents were working equally hard. We were just trying to survive as a family. I had to learn English from scratch, but I was making good grades -- especially in math and science. Parsippany High School was a middle ranking New Jersey high school. But I met a couple of teachers there that were extremely kind to me and helped me to make it through this tough experience. I graduated number six in my class. 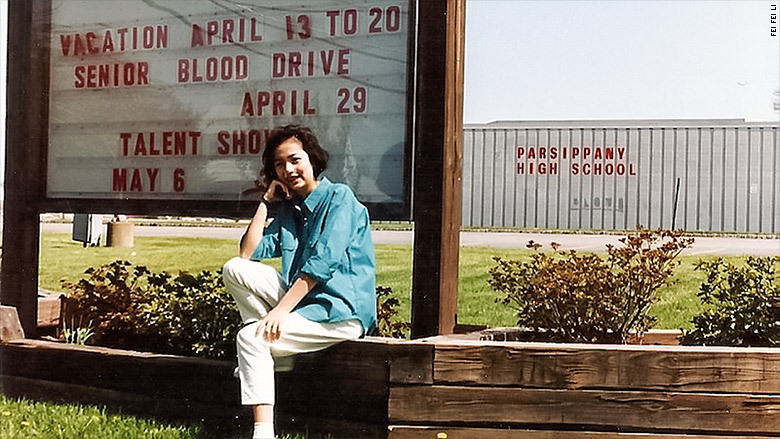 Li outside of her New Jersey high school. Did you feel like a part of the community in Parsippany? 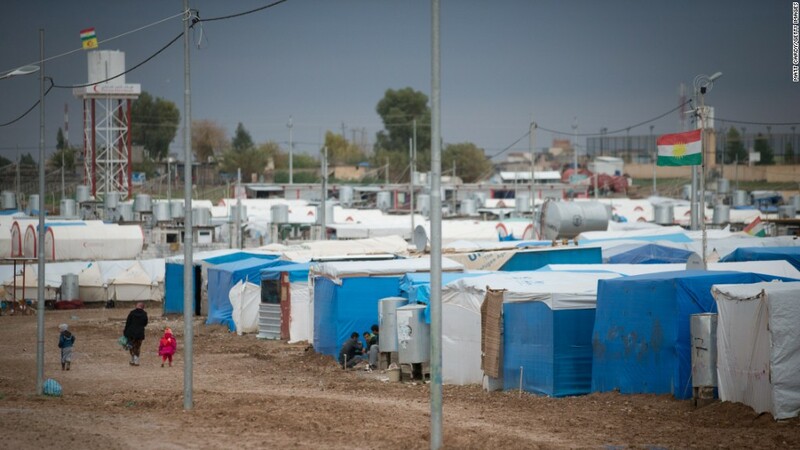 We had some immigrant friends, but everyone was busy and we were just in survival mode. I didn't make a lot of friends in high school. It's a cruel time and I was very geeky. But my high school teacher was a white American and his kindness really helped. I'm really thankful for the teachers at my mediocre New Jersey high school for helping me. I was a nobody, just an immigrant kid and I didn't speak any English. Seeking knowledge and truth was in my blood. I wanted to understand the universe and I wanted that kind of intellectualism in my life. I applied to a bunch of colleges, but Princeton gave me a nearly full scholarship. An early write-up of Li's story in the local newspaper. For the first two years of my immigrant life, it was all Chinese restaurants and cleaning houses and then I was [at Princeton] with all these wonderful intellectuals. I loved Princeton. However, my family in Parsippany was still struggling. I decided to buy a dry cleaner for them to work in and make money. Every day after class, I was on the phone to help them. For me it was A Tale of Two Cities: Parsippany and Princeton. So Monday to Friday, I was a physics student at Princeton. And on weekends, I'd go back to Parsippany [to work at the dry cleaning business] -- that's when everyone drops off or picks up their laundry. 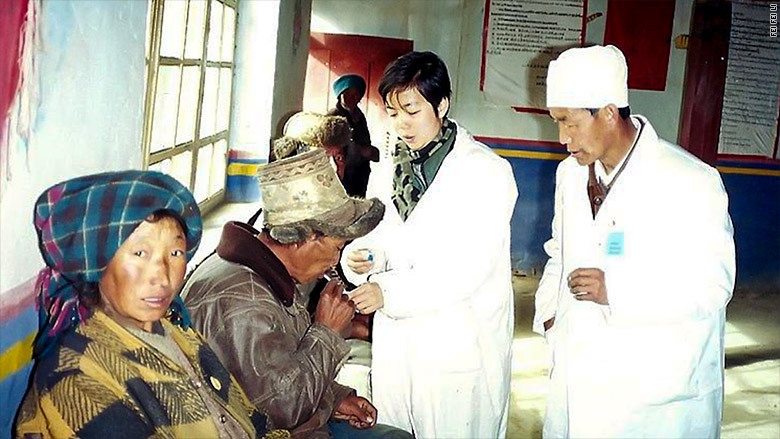 Li followed her dream of studying in Tibet. I graduated in 1999 during a huge bull market. We were all getting offers from Wall Street, but my dream was to go to Tibet to do a year of research on Tibetan medicine, which was crazy. Then my dream was to get a PhD, in which you get paid nothing. As a Chinese daughter, I have a responsibility to take care of my parents. When Goldman Sachs offers you a salary, it becomes a distraction because I could take the job and it would relieve [my parents' difficulties]. I was invited for interviews by a number of investment banks and management consulting companies, but I didn't go. A couple of years later, McKinsey did offer me a job, but I didn't take it. My parents were very supportive of my dreams. They came to this country to pursue a dream, then I should be able to pursue my dreams. I went to graduate school at the California Institute of Technology. I was studying artificial intelligence and computational neuroscience. Graduate school was hard and my mom had cancer and a stroke and we went through a lot of difficulties and we all survived together. The backdrop here is to do all this while navigating a completely new society or culture. I don't think I would be able to do it again. What helped you to keep it together? I'm a go-getter. It's in my DNA. If I spend a lot of time lamenting on the difficulties then it could be distracting. There were always people who have wanted to support me -- my parents, my teachers. It doesn't take 500 people. It just takes a couple and that makes a huge difference. What do you hope to leave for your children? That's a very cosmic question. I would rather do the best job to make a better world and our children will live in that world. Related: From New Orleans' Ninth Ward to CEO of Carnival Corp.
Is there something that you do every day that helps you? It's watching and playing with my kids. My field is intelligence. They shed so much light to my understanding on what it means to be intelligent and what it means to be a "being." It's so much fun to see how these kids grow and become humanly intelligent. I know that's geeky, but I believe that the ultimate power is love. As a technologist, you need to keep that in mind.